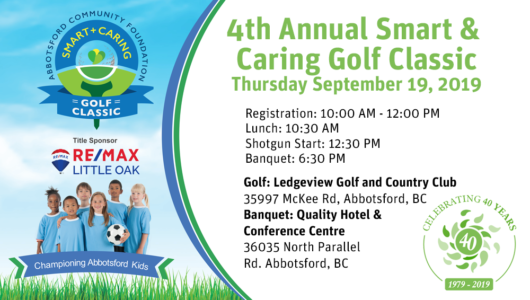 We are pleased to announce that our 4th Annual Smart and Caring Golf Classic will be held on September 19, 2019 at Ledgeview Golf Course. We have an exciting event planned and anticipate that we will sell out by June 30th so sign up today! The 3rd annual Smart and Caring Golf classic was held on September 20, 2018 at Ledgeview Golf Course, with a delicious banquet dinner at the Quality Hotel to wrap up the day. We are very thankful to our Title Sponsor, Re/Max Little Oak and Ray Yenkana for partnering with us for this special event. We had over 55 sponsors and a sold out event! All monies raised will be added to our Smart and Caring Community Grants fund which annually grants out over $70,000 to Abbotsford charities that have programs for children and families at risk in our community. We are thrilled to announce that we raised $100,000 at the 2018 event! Save the date for this year, September 19, 2019. Come out and golf for the kid’s sake! We are thrilled to announce that we raised $100,000 at last year’s event! Thank you to our generous sponsors and participants for making this possible! Click here to see photos from the 2018 3rd Annual Smart & Caring Golf Classic. If you’re interested in sponsorship opportunities or would like to register a team or individual golfers, please contact Wendy Neufeld, ED at wendyneufeld@abbotsfordcf.org or call 604-309-9274 for further details.